Must Keep Knitting The Precious!! My memory blanket grows again! I’m seriously and thoroughly addicted to this. And I’m running low on scraps!! 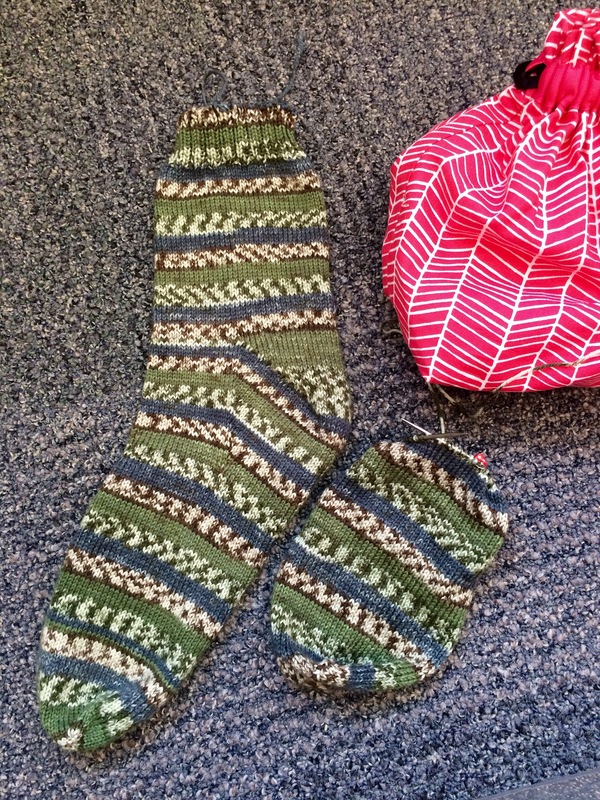 These socks are on the home stretch! 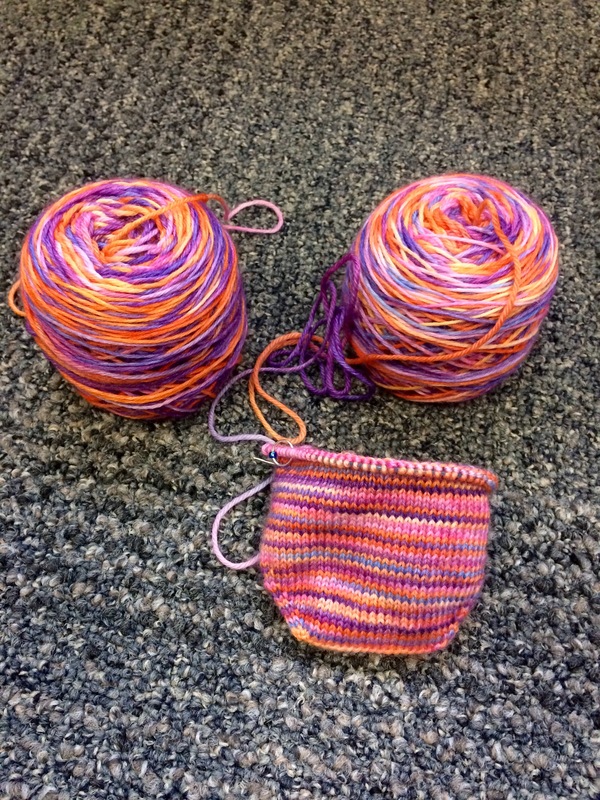 I’ve turned the heel and started up the leg. These are for a size 13 men’s foot and have 72 stitches. 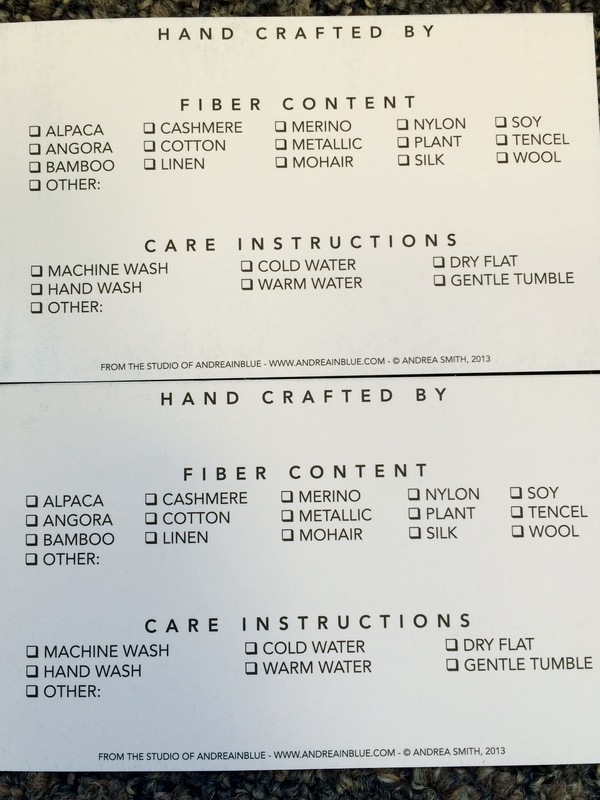 I feel like these have a weird time warp where I knit and knit but don’t get anywhere, Harrumph! 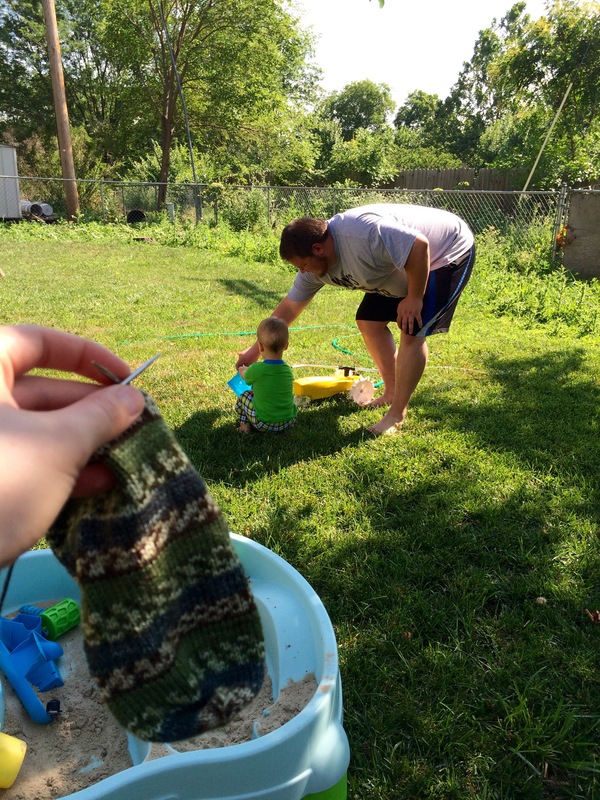 I think this means I’m ready to be done with these socks…. My brain space is still at a minimum so I’m once again working toe up vanilla socks over 68 stitches. Probably with a gusset heel but I haven’t decided completely. 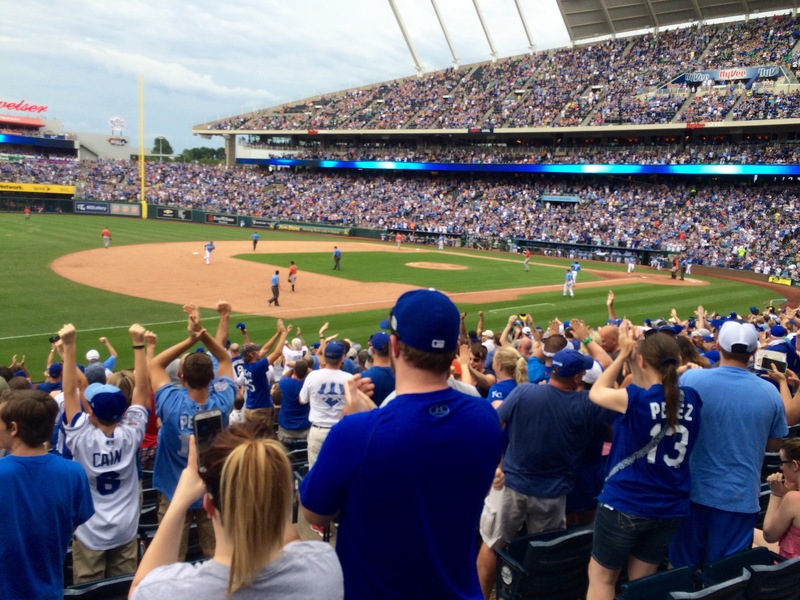 I go these started at the Royals game last weekend so they would count for #batterupkal2016! I was surrender by Muggles but only a couple people noticed and commented. They were very nice comments, I was pleased! The hubby and I stole some special time to celebrate our forthcoming 9th wedding anniversary. 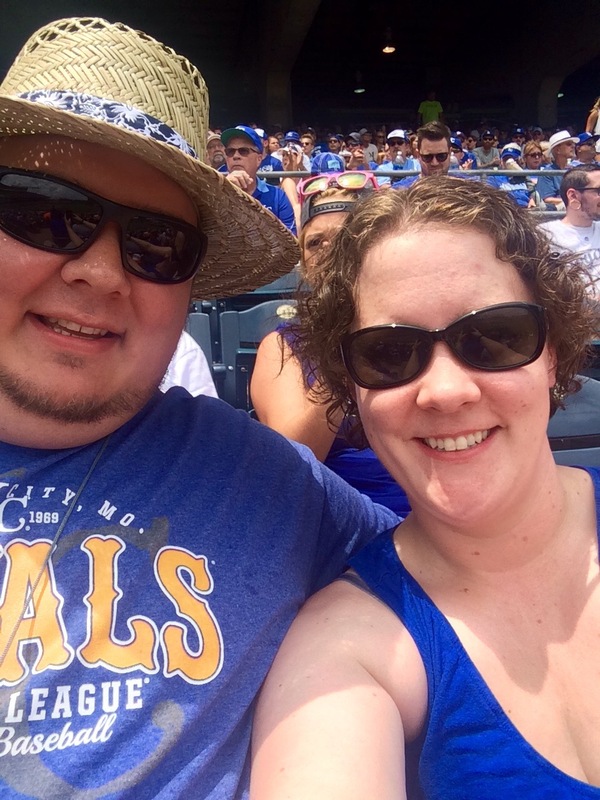 We live close enough to Kansas City that we made a BBQ and baseball date! 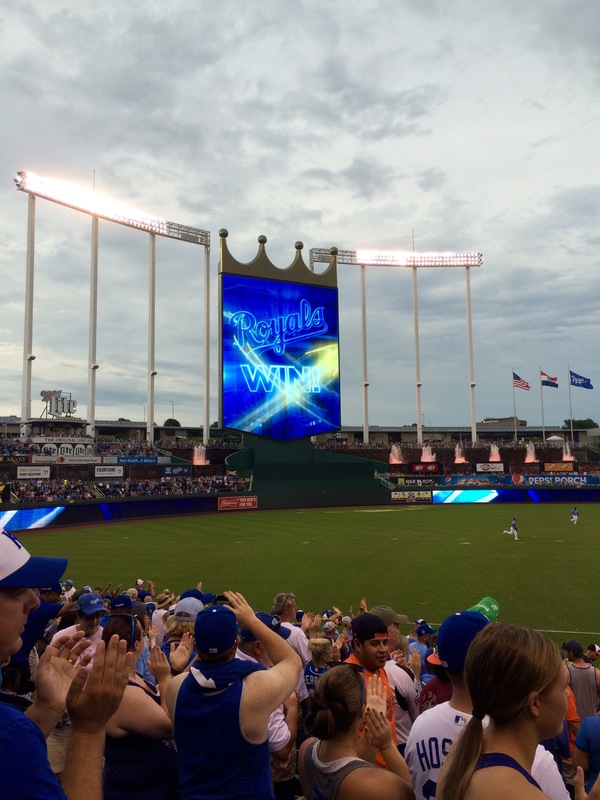 The rain held off and the Royals even won! I’ll catch you up on this new project later this week. 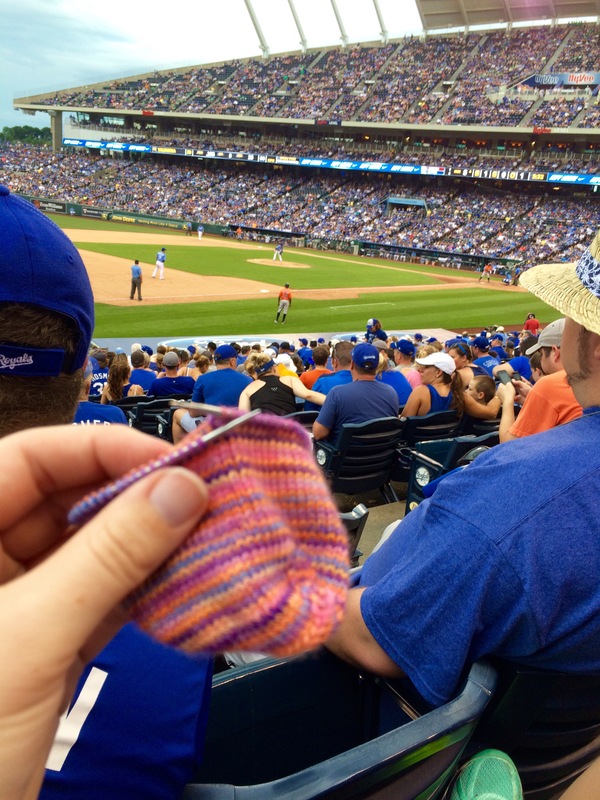 Happy Knitting!! Welcom to my OCD! I listen to a ton of podcasts and read blogs semi regularly. That means that this time of year I’m inundated with KALs. 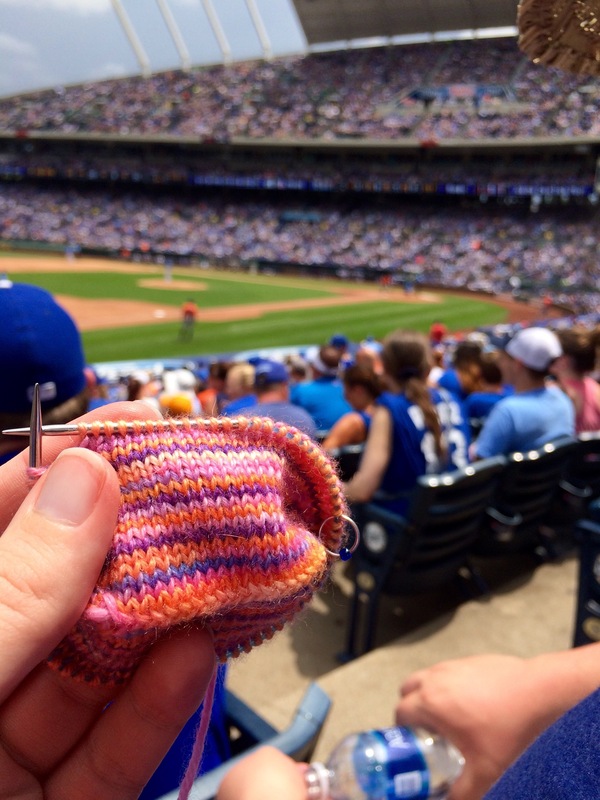 Don’t get me wrong…I love a good KAL. But I’m feeling a bit overwhelmed this summer. 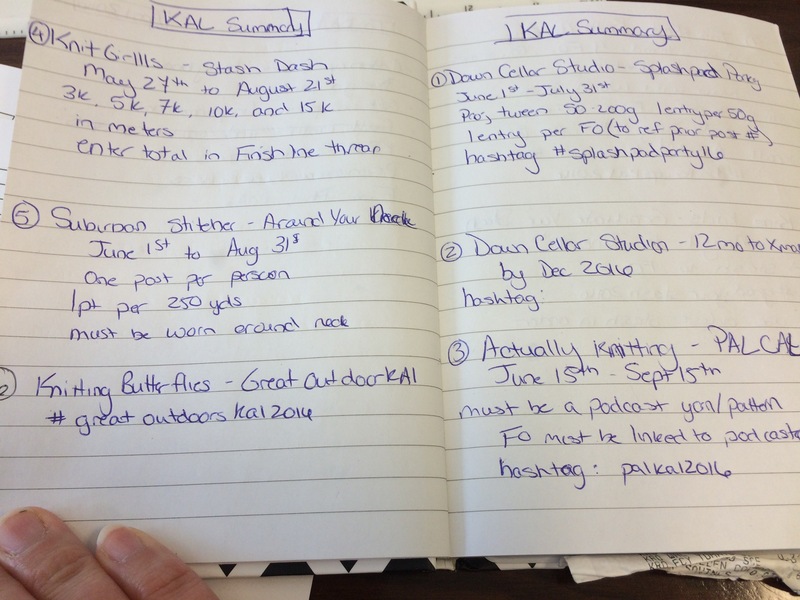 I started to write down each KAL with the relevant pertinent data and I filled four pages in my notebook! I quickly decided I can’t do all of them or keep them straight on the fly. So I’m going to knit what I want and if my FOs happen to fall in one of these then I just might enter. I’m much happier with that decision. How many KALs have you juggled? 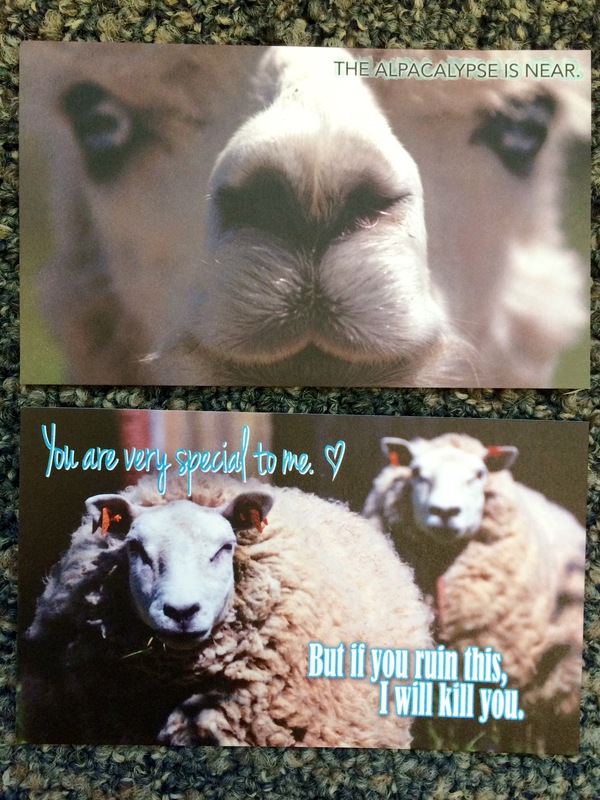 Functional yet hilarious care cards!! My Camo Vanilla socks got some unexpected love this past weekend. We had a last minute babysitter and the husband and I snuck off to a movie at the $2 theater. The movie was terrible but I got 2+ hours of knitting! I’m an inch away from startingthe heel gusset. 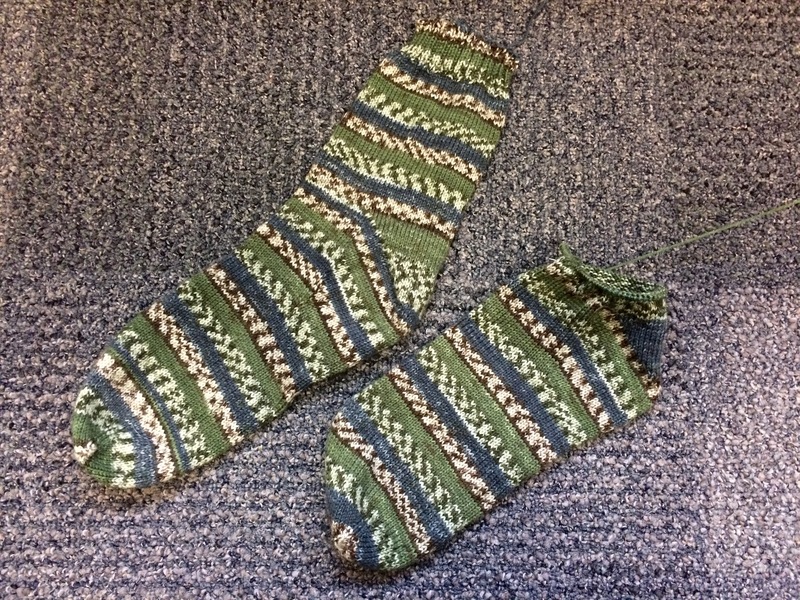 Fingers crossed I can get these done in June for the Down Cellar Studio’s 12 months to Christmas KAL! 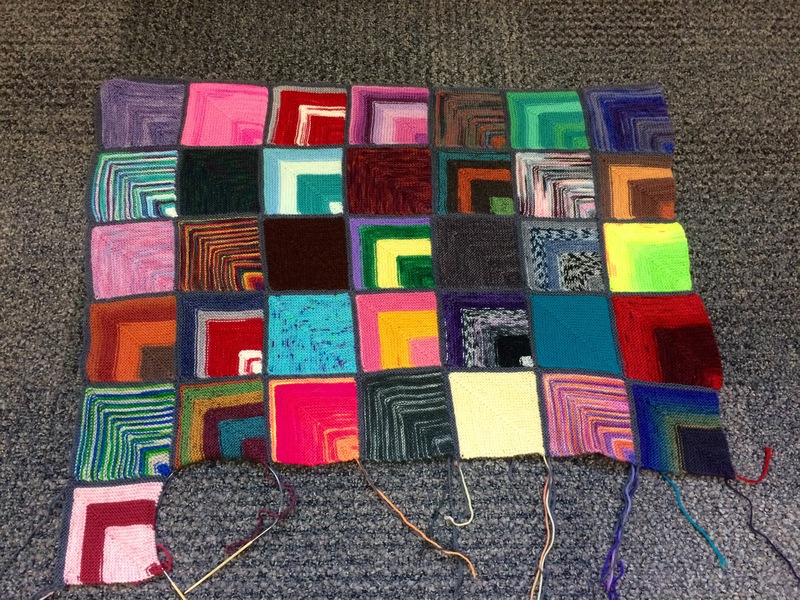 “The Blanket” is growing again! 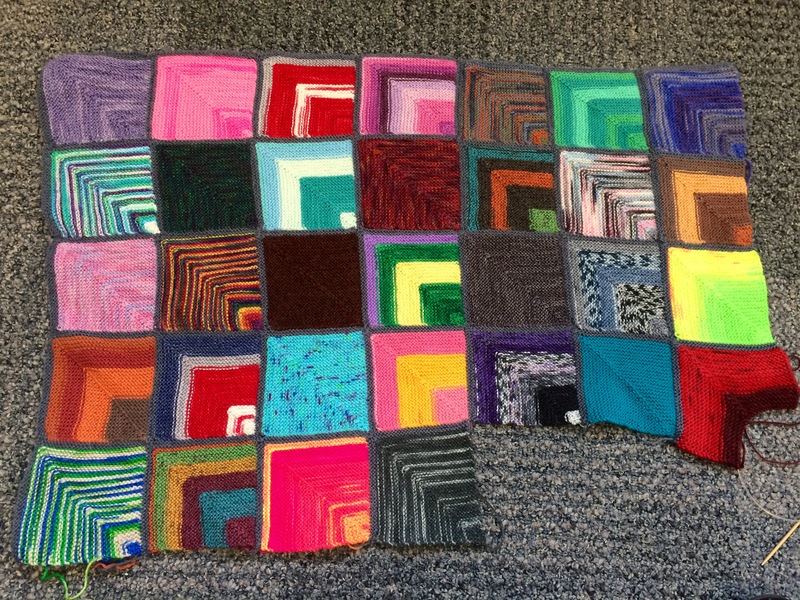 I’m at 31 and a 1/2 squares. I’m officially breaking in to some full skeins to add more to this blanket. It’s just so dang soothing and gratifying to work on I can’t stop! I still don’t love picking up the stitches but sharp tipped needles help quite a bit. And I’ve fallen behind on my weaving in of ends (I’ve hidden them cleverly under the blanket). Perhaps I’ll catch that up during lunch today? 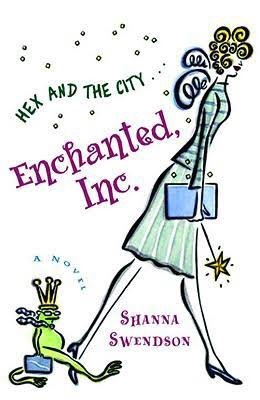 It’s kind of spy chick lit with a magic twist. The main character is relatable and while the books are fairly predictable I CAN’T PUT THEM DOWN. I’m already on 5 of 7 and not slowing down. I even find myself wanting to read instead of knitting. Oh the humanity!! I may be late to the party but I’m in love with my sock yarn memory blanket. My furvor has abated a bit with the crazy summer schedule we have but I’m still working on it. 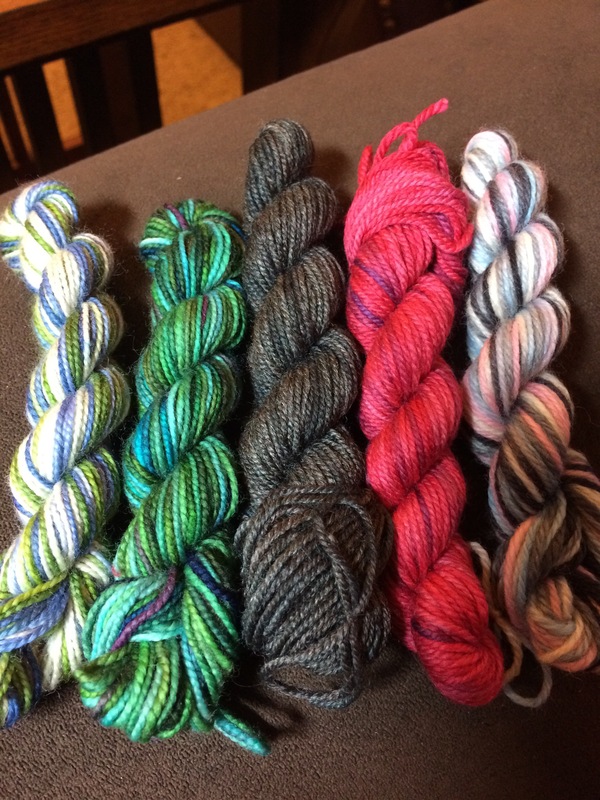 My personal taste in sock yarn runs in the same color families so I needed some colors to shake things up! I got these five skeins of “random” yarn and another five skeins of Shibui yarn sock minis (not pictured). I’ve already managed to work two into my blanket. Even know I feel the sirens call of my blanket. Maybe I can squeeze in half a square before work?